Although I can only claim one side of the bathroom sink (boyfriend has the other), I make sure that it has all the necessities. My sink isn’t very spacious, but there’s just enough room for the things I love. The Apa Clean White Sonic Toothbrush is unlike any toothbrush that’s ever touched my teeth, it’s so powerful. It does 40,000 vibrations per minute and has three different vibration patterns to choose from. It has disposable brush heads that come in a whitening bristle brush and soft bristle brush. Sometimes it can be hard to time your brushing and make sure you’re doing the full two minutes, but with Apa’s toothbrush you don’t need to keep track, it does it for you! 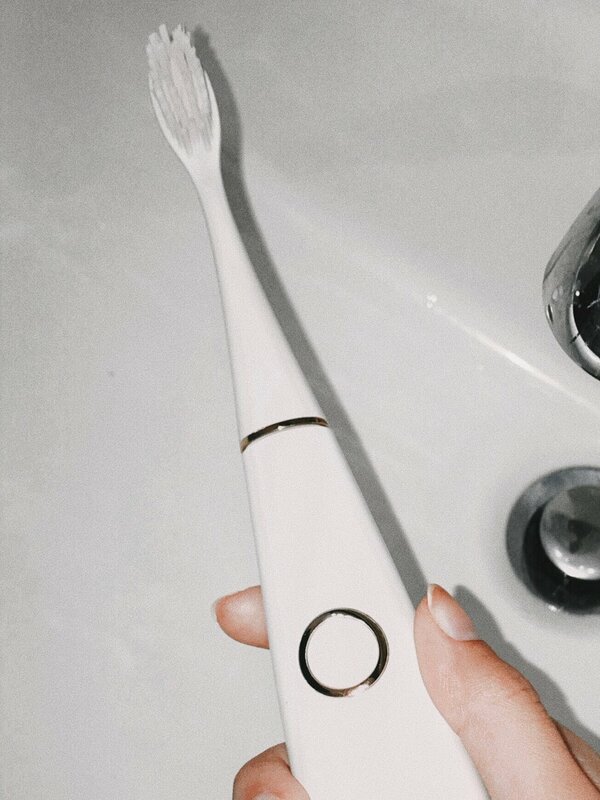 With four pauses in vibrations this toothbrush tells you when to switch to the next corner of your mouth and turns off automatically when two minutes is up. Of course, this is rechargeable and comes with a pretty little charging stand. There’s nothing better than a beautiful toothbrush sitting pretty on your sink that actually shows results! This is something I’ve had my eye on for a little while. To use in conjunction with the Apa toothbrush, they offer their White Toothpaste, Apa Pink gum gel and White Rinse mouthwash. All of that plus a gorgeous Johnathan Adler stand! Can’t resist. While I haven’t tried the White Rinse just yet and I don’t have the stand, I can vouch for their White Toothpaste and Apa Pink gum gel. The toothpaste is just the right amount of minty, not too overpowering like most brand name toothpastes. You need very little when you put it on your brush, just a pea size amount! This toothpaste doesn’t contain fluoride and still helps to get rid of stains and tartar while rebuilding the surface of your teeth using hydroxyapatite (the main mineral found in tooth enamel and bones). The gum gel contains Vitamin E, lemon extracts, cucumber, peppermint oil and Irish moss to repair the gums and fight off any bacteria. You simply massage it onto your gums after brushing and using mouthwash twice a day. All three products are also sold separately from the Johnathan Adler collaboration! All my favorite candles are by Joya. That’s why I like to keep one of their signature candles in my bathroom! They’re so beautiful and don’t have an overwhelming smell. The best thing about Joya’s candles are that they’re such high quality. Mai and I went to visit their store/studio in Brooklyn and saw how all the candles are handmade from the fragrance to the ceramics, painting and molding. It was really such an amazing experience to see the progress! It sort of makes you appreciate it more, knowing how much hard work was put into the creation of your candle instead of it being mass produced in a factory. Of course I have Joya candles sprinkled all over my apartment! I love a fancy hand soap. Don’t love when my boyfriend uses it like it’s something I bought at the corner store! Anyways, Diptyque’s Philosykos hand soap has had me falling in love with the scent. I never knew how much I loved the smell of fig until I smelled a Bastide perfume and this Philosykos hand soap. I don’t even like to eat figs lol. This soap has everything down, the packaging is gorgeous as usual (Diptyque never fails at packaging), great smell and can also be used as a body wash if you’re looking for a better reason to splurge on a soap. I’ll be sad when this is empty for sure. Lastly, I keep a cleanser on my bathroom sink. It only makes sense since I wash my face twice a day just like I brush my teeth twice a day! Since I’m always testing products, the cleanser that sits on my sink changes up a lot, but I have been loving the Omorovicza Cleansing Foam. Now, I’m not one for foaming cleansers because they usually make my skin feel so uncomfortably tight and dry after cleansing. Omorovicza’s cleanser actually hydrates your skin and regulates sebum production. The foam isn’t like one you’d pump out of a foam hand soap dispenser, it’s a rich lather that’s gentle on the skin. While this cleanser is priced high for the amount of product you get, it’s definitely a treat if you’re looking to spoil yourself a bit.